Delivery issues more than doubled in Florida last week compared to the week prior as Hurricane Michael swept through the Panhandle, according to data from Convey provided to Supply Chain Dive. Most exceptions were in parcel deliveries, with a smaller number of exceptions in LTL shipments. The effects of Michael on logistics also rippled outside of Florida. Delivery exceptions nationwide increased 20% week over week, while the number of shipments increased by just 2%. 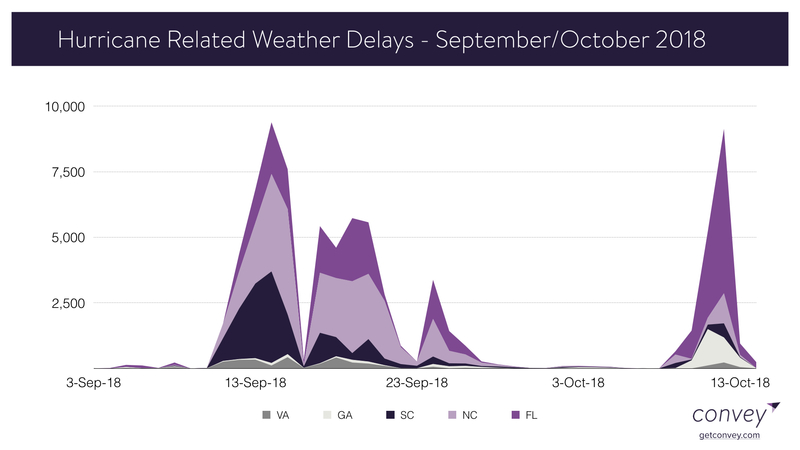 The week Hurricane Michael made landfall, Florida saw a total of 11,400 weather-related delivery delays, up from just 48 the week before. Georgia experienced more than 3,000 weather-related delays, and North Carolina had nearly 1,850. As Hurricane Michael barreled toward the Gulf Coast as a Category 4 storm last week, activity in the Florida Panhandle came to a standstill. Ports closed, and last-mile deliveries were suspended as the southeastern U.S. faced heavy rains and winds of more than 150 mph. Now a week later, residents are just beginning to return home. Photos show devastated coastlines with only a few lone buildings left standing. Food banks in the region have sought help from the American Logistics Aid Network (ALAN), asking for trucks and forklifts. The road to recovery for Hurricane Michael — and Florence — will be a long one as transportation departments set out to repair infrastructure damaged by the storms. While both Florence and Michael were devastating, the nature of the two storms was very different. Hurricane Michael moved quickly with strong winds, leaving destruction in its path. Hurricane Florence, on the other hand, was dangerous because of the storm surge and its slow movement, creating severe flooding in coastal and inland parts of North Carolina. For several days after Florence, shipment delays lingered in the Carolinas. It's too early to tell whether Michael will create the same effect of lingering delivery delays in Florida.